Paediatric courses covering first aid training are required for many people working with children. Lazarus Training runs paediatric first aid courses to meet the varied needs of the early years setting, early years workers and parents, grandparents and carers. Courses can be as short as an hour and a half, but our most popular paediatric courses are: Paediatric Basic Life Support, Paediatric First Aid and Anaphylaxis Awareness training. We also offer bespoke paediatric courses on request, covering a wide range of paediatric first aid topics. Details of the content of each individual paediatric course can be found via the links above, but Lazarus Training often adapts its paediatric first aid training to meet the specific needs of its clients. We have run paediatric courses for groups with specific interests or concerns. Approval for Paediatric First Aid training. For those needing Essex County Council approved paediatric first aid training, Lazarus Training is recognised by the council. For those needing Southend on Sea Borough Council approved paediatric first aid training, Lazarus Training’s courses are recognised by the council. We believe in making the training relevant and reliable, sharing useful information [such as the video below] but focusing on the key life saving skills needed. Have you got a couple of minutes? It could save a life.Watch our signs and symptoms video. Share it with your friends and family. Help us raise awareness. Want to talk about Paediatric Courses? 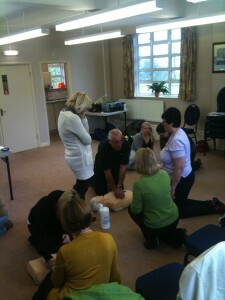 Hi I am looking to do a paediatric first aid course, I am in Colchester but will to drive. In needs to be the 12 hour course approved by Ofsted for childminders. Could you let me know what you have available. Hi. Thank you for your interest in our training. Kelly from our admin team will be in touch to answer your query.